The morning started kind of early for me, getting to where I work at 7 AM to meet some guys I was riding down with before we joined up with the bigger Bareknuckle cruise to the show. Bareknuckle., Montpelier, Vermont. 688 likes. Bareknuckle. Promoting Guy stuff. We then departed and headed for the Lebanon weigh station where we would be meeting the rest of the Bareknuckle guys. This turned into a kind of car show itself. Bareknuckle! These guys had already done about 60 miles when they got here, and had another 90 to get to New England Dragway. Tom, the leader of Bareknuckle, showed up and it was time to head out. As I wasn't driving I took the opportunity to take some rolling shots of the crew out the window of the R32. Before we too long we were waiting in the staging lanes with all the show cars, the drag cars, and the regular cars that were just there to spectate. There was also an officer walking around giving out "tickets" for a free T shirt if you were wearing your seatbelt. I took this around 10AM, thinking the turnout wasn't too bad. Little did I realize this was a small portion of what was coming, and that pretty soon the entire lot would be packed. Menace Crew's Dodge Ram was more of a jungle gym than a truck, with their kids playing on it all day. 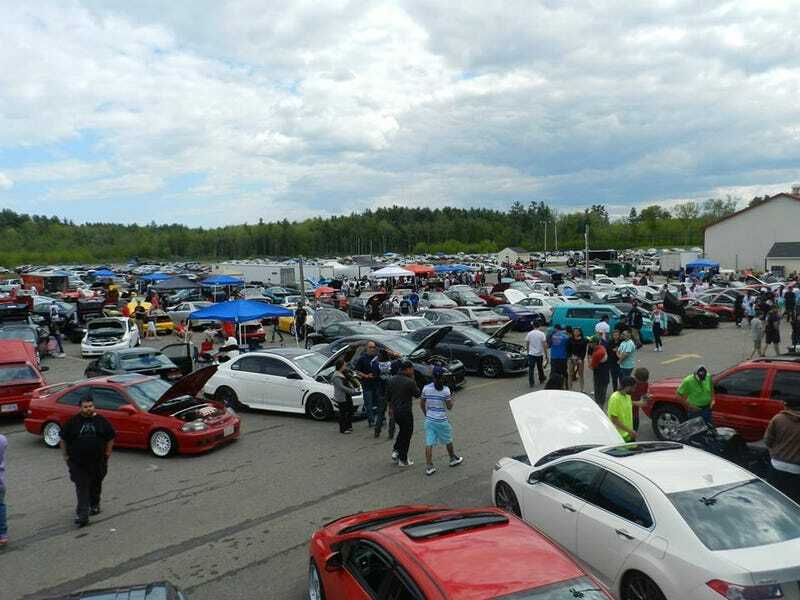 Being Import Faceoff, there were a lot of Hondas, but most of them were done pretty well. I'd never been to a drag race before so watching people make their runs was pretty cool. I love little cars like this Corolla that pack huge power in such a lightweight car. My friend Jeremy's Saab lining up against an Evo X, Jeremy beat the Evo when something broke on it. After watching the drag racing for a little while I decided to walk out to the parking lots and see what I could find out there. Too much cool stuff that didn't go into the show. I have an unhealthy level of want for this thing. I thought this was sorta bad, but one of my friends loved it. What do you guys think? I look like an idiot, but it did go with my sweatshirt. I walked back over to the show and saw a ton of cars I hadn't taken pictures of yet so I started snapping away on this Teggy. It was kinda hard to shoot because it had a crowd around it all day. If you guys remember my Wolfsgart coverage, you remember how much I absolutely love 802 Performance's Bug Eye. Wolfsgart 2013 the Super Ultra Mega Photodump. Not all the cars were great, but I expected them to be much worse. The drag racing and car show wasn't limited to just imports, and these guys brought out two third gen Camaros to play with. In fact, there was a brand new Viper there too. I found this Beetle in the staging lanes for drag racing and knew I'd have to hunt him down later. Anybody who knows me knows my obsession for the aircooleds. I found him later getting ready to head out. He had the bug parked next to his trailer, which house a VW powered T bucket drag car. Oh yeah, it's a '50, so the split is real! After wandering for a while, I heard the burnout contest being announced over the loud speaker. I decided I'd go over there and check that out. About the same time as the tread ripped off and messed the fender and corner light all up, the driver had to get out because he couldn't breathe. Then it was time for the magical disappearing Geo Storm. When the smoke cleared it was time for the awards. Everyone packed in as close as they could to hear who would get the trophies. Teddy Newman got 2nd place in the Best Subaru category. Derek Kenison won Best VDub in his GTI. And the head honcho Thomas Peabody won Best Import SUV in his Honda Element. After all the awards were handed out everyone started trying to make their way for the exit. Thanks for taking the time to read this, and huge congrats to everyone who won something. Huge shoutout to the Bareknuckle guys for making me feel like family, and to Jason Stride for letting me ride down in his R32. These aren't even CLOSE to all the pictures I took. Click here to see all 482 photos I took. I'll see you guys at the next show.